5 principles: every regenerative farm will operate differently but there are five principles that we all follow. No-sprays Synthetic fertilizers, pesticides, and herbicides can disrupt the symbiotic balance, or worse, kill off critical parts of the soil food web. Residues persist on the soil and vegetables, cause more harm than benefits, and negatively affect the soil over the long term. At Tierra Vida Farm, we do not use any synthetically derived amendments. There are better ways to manage weeds, pests, and fertility. Where in nature do you see bare soil? The answer is nowhere ... unless that soil has been damaged. When soil is exposed to excessive heat, strong winds, and cold temperatures the microbiology suffers. As microbiology declines, soil becomes much less resilient in the face of both droughts and floods. Without strong soil biology, top soil can be easily blown away during droughts and washed away during floods. Keeping the soil covered protects the microbiology. Transplanting By transplanting crops, as opposed to growing them from seed, we can minimize the amount of time the soil is bare since transplants are often 2 - 4 inches tall when we put them in the ground. During the growing season, as soon as we harvest a crop we either transplant another one or seed a cover crop. We start our transplants in a greenhouse in March & April which allows us to get living plants into the soil much earlier in the season. Compost Adding in not just minerals and nutrients, compost also provides a boost to the soil microbiology and keeps the soil covered. We apply a thin layer of compost to each of our raised beds before transplanting a crop. We make our own compost with a combination of wood chips, hay, manure, leaves, and food scraps. Cover crops & grazing Anywhere that we are not growing a cash crop we grow cover crops. Our cover crop mixtures help revitalize the soil and provide flowers for pollinators in addition to keeping the soil covered. Before the cover crop goes to seed, we set up an electric fence and rotationally graze a herd of dairy goats. 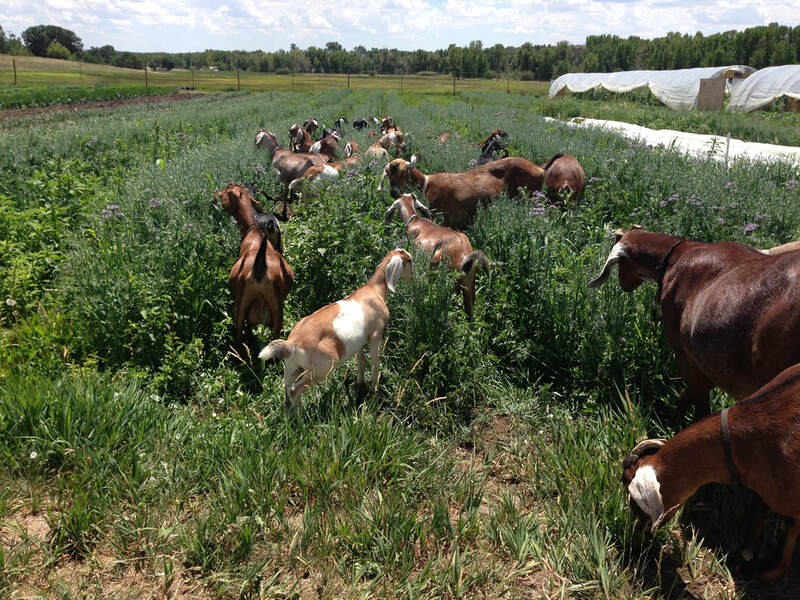 The goats mow down the cover crop, deposit valuable manure & urine, and trample debris into the soil. Rotationally grazing cover crops is a powerful way to build healthy soils. As farmers, our job is to facilitate the movement of carbon from the atmosphere into the soil and then let the soil biology take it from there. Plants take carbon from the air and put it into the soil via photosynthesis. Fungi and bacteria in the soil bring nutrients and water to the plants in exchange for carbon. It's a beautiful exchange that we're just beginning to understand. It's our responsibility to keep as many plants growing for as long as possible in order to maximize photosynthesis. Transplanting during our short growing season, transplanting allows us to maximize photosynthesis by getting living plants into the ground earlier in the season. We are able to transplant frost hardy plants April 1st and warm weather crops by the beginning of June. 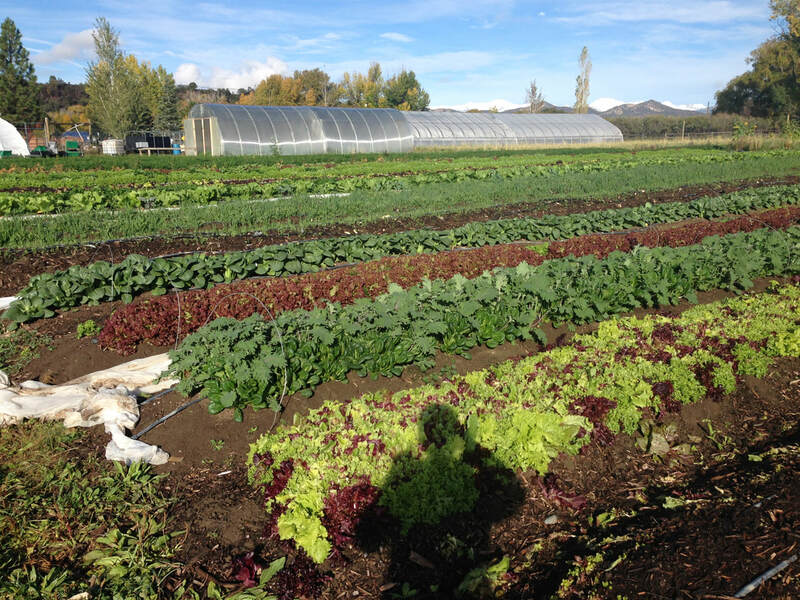 By transplanting, we can reliably have living plants in the soil for 6-8 months in our Colorado climate. High Density we grow our crops very close together. By growing at high-density we maximize yields per acre, keep the ground covered, suppress weeds, and feed the soil biology via photosynthesis. We aren't worried about depleting the soil by planting densely because we aren't destroying the microbiology by tilling and we provide extra food for bacteria and fungi via compost. Healthy soil, teeming with microbiology, ensures there is plenty of nutrition available to keep plants healthy. Animals need plants and plants need animals, it's as simple as that. One of the big mistakes made in the last 50 years was separating crop and animal production. When animals graze they improve soil health in several important ways. When an animal bites off two inches of a plant that plant will shed two inches of roots. Those roots then become food for life in the soil. Animals deposit valuable nutrition via manure and urine. They also increase ground cover by trampling plants into the soil. Figuring out how to integrate animals into vegetable production isn't always easy but it's definitely important. Goats We rotationally graze a herd of 30 goats on our cover crops. Electric fences are set up to ensure the goats don't sneak away to eat the lettuce (which they love). We let the goats graze about one third of the cover crop. During that time, they fertilize the soil. Goats are ideal for us because they can actually digest seeds which makes them part of our weed management strategy as well. Horses & Chickens Although we do not have horses and chickens physically in our fields, we do incorporate their manure into our compost recipe. Increasing diversity is something we're always striving for and that includes the types of manure we use. Multi-species rotational grazing is something we plan to explore in the near future by incorporating chickens into the cover crop grazing strategy. Like bare soil, you don't find monocultures in nature. Diversity breeds resilience and yet, in agriculture, monoculture has become normal. Growing just one or two crops is risky for farmers because the failure of one crop can mean zero income. On the other hand, growing a diversity of crops (sometimes referred to as polycultures), can keep a farm afloat in one or two crops fail. As it turns out, polyculture is good for the soil as well as different plants feed the biology in different ways. Rotating crops also reduces pest pressure. As regenerative farmers, we are always striving to increase diversity in our operations as much as possible to both improve the health of the soil and create business resilience. CSA We love our CSA for many reasons including the wonderful community and friendships we develop with our customers. 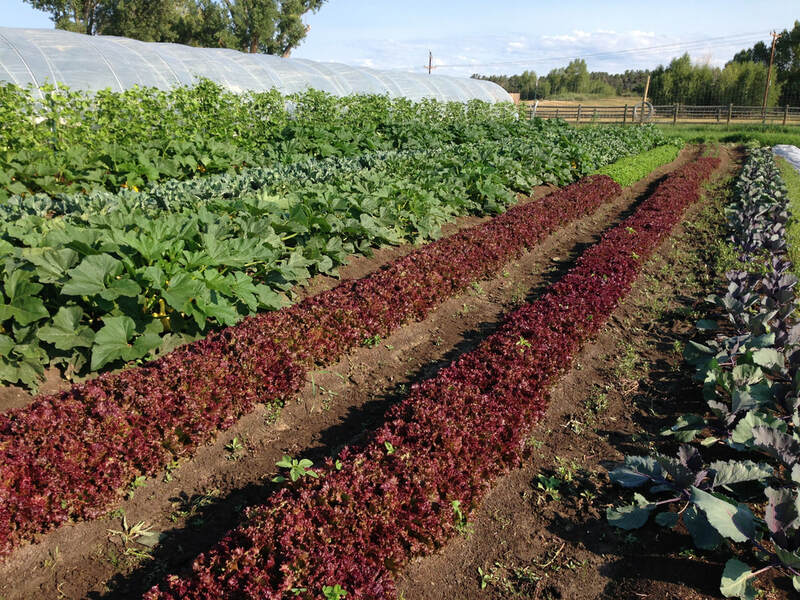 The CSA model encourages us to produce a wide variety of vegetables for our members. Because of the CSA, we grow around fifty different varieties in any given season. We rotate the location of crops so that the same plant is rarely grown in the same place for multiple years. Interplanting Plants enjoy diversity and so does the soil community. Planting peas and kale together, beans and radishes, cabbage and cilantro, and marigolds with collards provide many benefits. Intercropping improves soil biology, attracts pollinators, and discourages pests like moths and aphids. At Tierra Vida Farm, transplanting allows us to easily intercrop. Pollinator Rows Native pollinators and domestic honey bees provide so many benefits, it's worth dedicating some space to feeding them. Pollinator strips provide flowers throughout the year, harbor beneficial insect predators, and add beauty. We use native flowers and perennial shrubs to encourage beneficial insects to take up residence in the garden. This one is not part of the principles of regenerative agriculture but it's an important growing practice. After all the effort that has gone into creating healthy and nutritious food we want to make sure that it stays fresh. Rinsed and chilled Produce is dipped in cold, clean well water right after harvesting to lock in vitamins and ensure freshness. A few hours in the sun - or not - can make all the difference in quality. Although rinsed in potable water, consumers should always wash produce at home. At Tierra Vida Farm, the shaded washing area is a quick 200 foot trip from the field. Refrigeration: Nearly all vegetables quickly lose freshness and vitamins if not refrigerated quickly after harvest. Refrigeration extends storability, maintains freshness, and maximizes vitamin content. We use a mobile refrigerator and maintain temperatures below 40 degrees until delivery to preserve freshness. ​Travel Time: How long does it take to get a case of conventional lettuce out of the field, onto a truck, into a warehouse, onto another truck, driven 1,500 miles, and shelved before purchase at a grocery store? 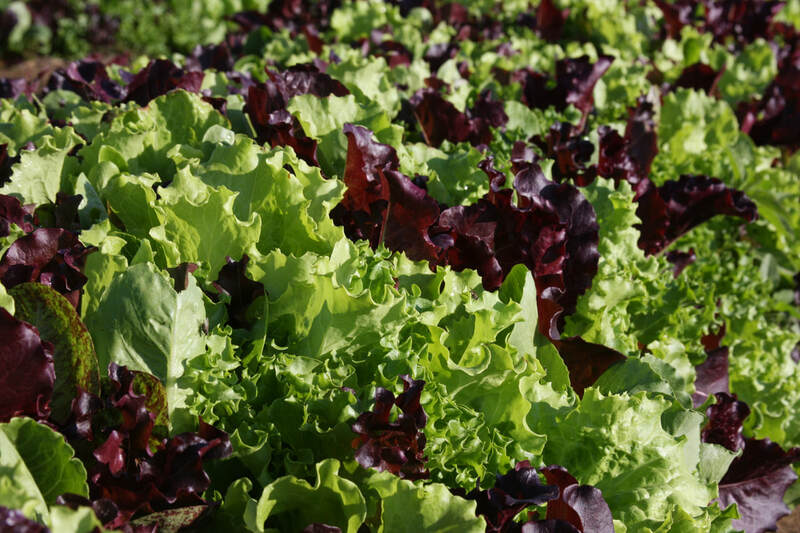 1-4 weeks for lettuce, and significantly longer for just about everything else. Our produce is harvested 48-24 hours (roots vs greens) before delivery and refrigerated until you pick it up.